One of the main concerns with building a tiny house is how you hook it up to utilities. Initially we plan to get electricity from an extension cord to a nearby house. A former master electrician has already assured me we’d be able to run a small AC unit, dorm sized fridge, a few lights, etc. on a heavy gauge cord alone without any problems. Solar power may also be an option in the future. For water, we were planning to hook it up to the house’s garden hose and add a camping tankless hot water heater. That way you get hot showers on demand. The gray water (from washing) would go nicely back into a garden or yard. You’d need to think ahead a little to avoid drainage issues. Hook up standard plumbing to either the city sewage or build a septic tank. Install RV type toilets and holding tanks. 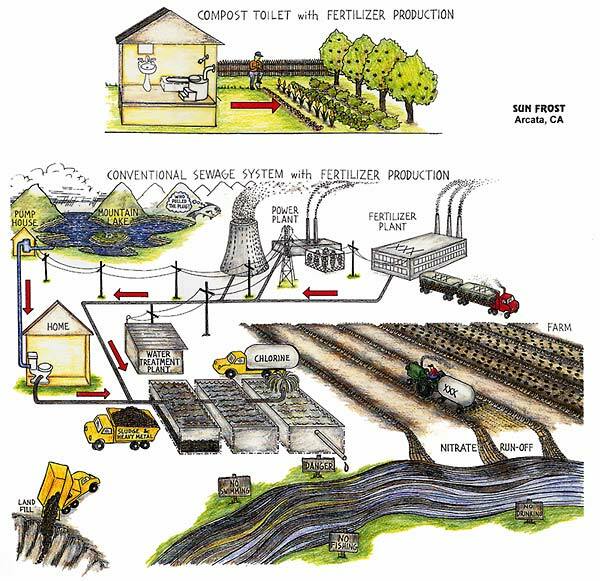 Set up a simple composting toilet. The first option requires permits and permanent establishment. Obviously if we’re building on a trailer, that’s not what we have in mind. The second option requires a lot more cost and moving the house back and forth to an RV sewage dump. That too, would be a lot of time and expense. Use it like a normal toilet. Cover what you put into it with sawdust, wood chips, shredded newspaper, etc. When it gets full, dump it on a compost pile and cover that too. As a bonus step, you’ll end up with compost you can use for your garden. Another benefit to having a composting toilet is that you might start paying more attention to your diet. If you’re composting your waste, you might reconsider that double order of chili cheese fries you know you’d have to carry out later in a bucket and feed to your roses. It wouldn’t hurt to be more conscious of that part of the impact our lives make. It’s another way to reconnect to the land. Anyway, I think simple is better. If you Google it, you’ll find that more and more people are starting to agree. This entry was posted in Philosophy, Planning and tagged composting toilet, plumbing, tiny house utilities. Bookmark the permalink. I used a composting toilet before in a previous residence. It is relatively odor free but does take a lot of time (dumping buckets on the compost pile). Also unless you want to get really serious about your compost (rotating it often, watching the balance of green and brown compostable material, etc.) and can get it to heat up enough to kill pathogens, it is best to use your humanure for ornamental gardening and not for food crops. But overall, i think it is the way to go for a project like this. I read “The Humanure Handbook” some time ago and recall the author saying that contrary to popular opinion, it’s best NOT to rotate compost. That hinders the temperature from getting to where it needs to be. I’ll see if I can get a more thorough response and post it here too. I am thinking of putting an RV toilet in my residential home. Even a low flow residential toilet flushes 6000 milliliters or 6 liters (1.6 gallons). RV toilets flush 500 milliliters or 0.5 L. Has anyone seen, heard, or done this? It would save SOOOOOOOOOO much water. We use Tecmas, from Germany. Smooth, relatively quiet, have never had mascetator problems in 8 years of use. And about 500cc per flush. Requires pressurized fresh (or salt) water supply.